A City alumna is celebrating after her team was named among the winners at the 2015 British Academy of Film and Television Arts (BAFTA) awards. 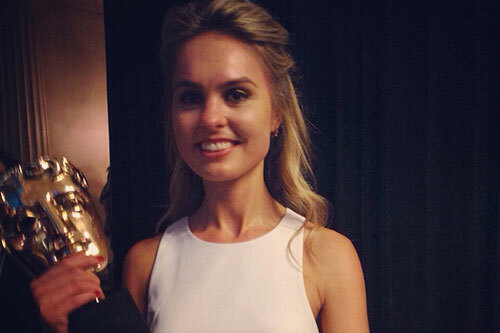 Vicky Taylor, who completed the MA International Journalism course in 2010, is an Assistant Producer on The Graham Norton Show, which won the Comedy and Comedy Entertainment Programme category. The graduate collected the award alongside her team, from production company So Television, at the ceremony on Sunday 10th May. Vicky began work on the BBC One show as a researcher in 2012. She said: "Just to be nominated and to be able to attend the awards on behalf of the show was pretty incredible but to win the BAFTA on the night made it extra special. I love my job working on the show and am just so lucky to be part of an amazing team. "After finishing my Masters at City University London, I soon realised that I wanted to pursue entertainment journalism. Although I studied international broadcast journalism, when I got the chance, I always engineered my choice of projects towards entertainment and culture. "The broadcast experience I gained at City definitely pointed me in the right direction." International Journalism MA Programme Director, Brendan Martin, praised Vicky's progress since completing her studies. "Here on the MA International Journalism course, we are delighted that Dubliner Vicky has done so well for herself in television since graduating in 2010," he said. "Since then she has worked for RTE and was part of the LOCOG Olympics and Paralympics 2012 research teams before landing her job as researcher with So Television, makers of the BBC One Graham Norton Show. "Vicky was part of the team that went on stage at London's Drury Lane Theatre on Sunday 10th May to collect the BAFTA for Best Comedy and Comedy Entertainment Programme. "I am pretty sure that this won't be the only BAFTA-winning team of which Vicky will be part."